This chapter deals with the Perron root of nonnegative irreducible matrices. Applications abound with nonnegative and positive matrices so that it is natural to investigate their properties. In doing so, one of the central problems is to what extent the nonnegativity (positivity) is inherited by the eigenvalues and eigenvectors. The principal tools for the analysis of spectral properties of irreducible matrices are provided by Perron–Frobenius theory. A comprehensive reference on nonnegative matrices is . Some basic results are summarized in Appendix A.4. For more information about the Perron–Frobenius theory, the reader is also referred to [3, 4, 5]. We have divided the chapter into two major parts. The purpose of the first part is to characterize the Perron root of irreducible matrices and present some interesting bounds on it. There exists a vast literature addressing the problem of estimating the Perron root of nonnegative irreducible matrices. Tight bounds on the Perron root have attracted a great deal of attention over several decades. A brief (and by no means extensive) summary of some related results can be found at the end of this chapter. In the second part, we consider the Perron root of matrix-valued functions of some parameter vector. In this case, each matrix entry is a continuous nonnegative function defined on some convex parameter set, with the constraint that the matrix is irreducible for every fixed parameter vector. As a result, the Perron root can be viewed as a positive real-valued function defined on a convex set. Now the objective is to provide conditions under which the Perron root is a convex (or concave) function of the parameter vector. 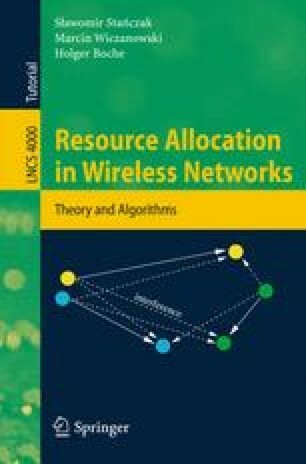 Note that the convexity property is a key ingredient in the development of access control and resource allocation strategies for wireless networks.